Most of the settlements that appear on a map of North America in 1650 exist today in some form, even if moved several miles up the river or renamed after merging with a larger settlement or rebuilt after total destruction in an Indian war. We call them permanent because they're still here. Simple enough, but determining why they're still here leads us to more elusive criteria. Prosperity. Numbers. Geography. Luck. Change of vision. The settlers' commitment or stubbornness, depending on one's view. And the goals of the colonizing nations, obviously. Spain maintained its American empire for "gold, God, and glory," the first dominating the crown's policies. From the gold and silver mines of Mexico and Central America were shipped enormous quantities of ore to Spain, and the thousands of Spanish settlers in the Americas worked in support of the crown's mining and conquest ventures. 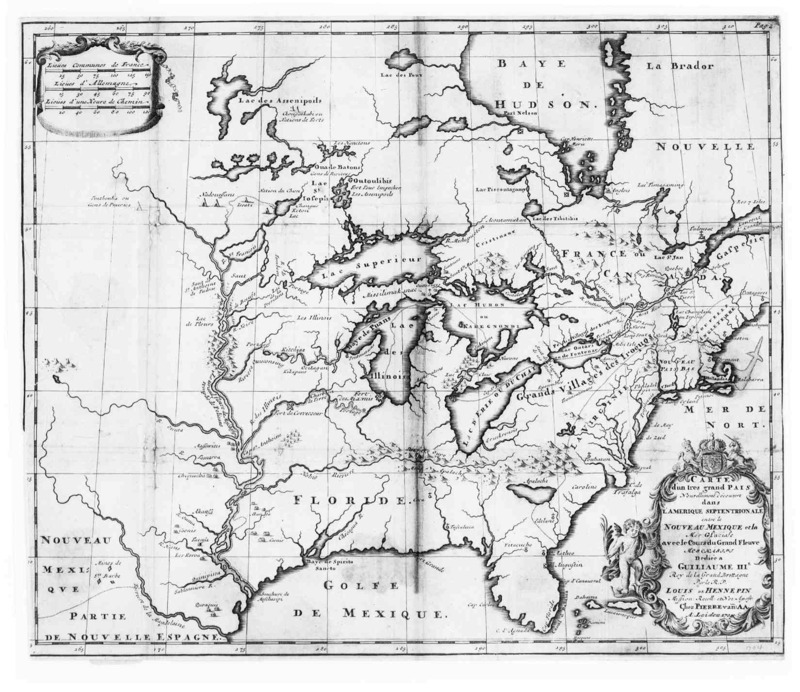 France had the fewest settlers in North America since its riches came from fish and furs, neither of which required large and permanent settlements. The English, however, did not establish colonies on direct orders of the crown. Instead, with permission of the crown (charters), private groups of investors established their own settlements in pursuit of their own economic goals. Their first attempts were disastrous. Permanence would require, as historian Karen Ordahl Kupperman states, "a complete overturning of previous notions of what colonies were to be for. . . The keys lay in learning about the environment and what it would grow, and then finding a commodity for which an infinitely expanding market existed or could be created in Europe. "* By 1650, the English had made this transition. Here we look at four prosperous settlements in North America in the 1600s, colonies of Spain, England, and France. NEW SPAIN (MEXICO). Decades before the founding of Jamestown, Mexico City was the thriving metropolitan center of New Spain. Settlers who had been there long enough to create stable lives and successful trades wrote to their relatives in Spain encouraging them (pleading with them at times) to join them and share in the prosperity of New Spain. Here we read from the letters of a farmer, a cloth trader, a tanner, a dealer, a priest, a troubadour, and the wife of a textile mill owner, between the years 1558 and 1589. BARBADOS. Barbados, the easternmost Caribbean island, dominated the islands' sugar trade in the 1600s. For three of those years, from 1647 to 1650, Richard Ligon operated a sugar plantation on the island with several colleagues, a venture he details in A True & Exact History of the Island of Barbadoes, written soon after his return to England. By "history" he means "natural history," as he describes the plants, animals, and other resources of the island. His main theme, however, is the wealth from sugar awaiting the willing hardworking "adventurer" (he could have titled the work A True & Exact Primer on the Cultivation of Sugar, or How to Become a Master Planter in One Year). Here we see the western hemisphere as a place where one can invest in existing infrastructure instead of building anew. MARYLAND. George Alsop was an indentured servant in Maryland for four years, from 1648 to 1652. After returning to England due to illness, he wrote a promotional piece, A Character of the Province of Mary-Land, to encourage others to emigrate to Maryland and share the prosperity enjoyed by the colony due primarily to one crop, tobacco. He presents a picture of a thriving peaceful colony and gives us a glimpse of the religious diversity already manifest in English America. Later the tobacco market would collapse in the southern colonies for a time, primarily due to overproduction, but at this point Alsop could herald tobacco as "the current Coin of Mary-Land." NEW FRANCE. Although the French had participated for centuries in the cod fisheries off Newfoundland, they did not pursue a colonial presence in North America until beckoned by the promised wealth of furs. Imagine a map of New France in 1650. A few dots along the St. Lawrence River would indicate a few small towns and several dozen Catholic missions. But the business "hub" of New France was made up of the countless trading posts where French traders exchanged European goods for furs provided by the Indians, especially beaver pelts. Here we read of the centrality of the fur trade for New France in two accounts from the late 1600s, the first by the colonial official Louis Armand, Baron de Lahontan, who travelled extensively throughout the interior, and the second by priest and explorer Louis Hennepin (who notes the superior track record of the English and Dutch in creating colonies in this "very large country" of America). What factors determine the prosperity of the settlements, according to these writers? Why do they define "trafique" (trade) as central to a colony's prosperity? What constitutes personal success for these men? national success? What promotional messages do they convey? What warnings do they state or imply? How have relations with the Indians changed? Compare (a) the personal letters with the published works and (b) the travellers' accounts with the planters' and workers' accounts. Compare the published works in this section with the promotional pieces for settlers and investors in the 1500s (see EXPLORATION and SETTLEMENT). How do these works convey the permanence of the settlements through the writers' selection of facts and through their tone and emphasis? New France, New Horizons: On French Soil in America, from Library & Archives Canada, et al. Fur trade: "A Beaver 26 inches long from the head to the tail," New France, 1703 illustration in frontispiece of Louis Armand de Lom d'Arce, Baron de Lahontan, Nouveaux voyages dans l'Amérique septentrionale (New Voyages to North-America), 1703. Digital image by the National Humanities Center from the 1905 reprint of Nouveaux Voyages, ed. Rueben Gold Thwaites, Chicago: McClurg & Co.
Tobacco: Tobacco plant, engraving by Crispijn II de Passe "Petum Maius, Sive Latifolium [May, or large-leaved, petum]," engraving in de Passe, Hortus Floridus [The flower garden], 1614. Reproduced by permission of the New York Public Library, Spencer Collection. Sugar works, French West Indies: detail of illustration in Jean Baptiste DuTertre, Histoire Générale des Antilles Habitées par les Francois, 1667 (copy in John Carter Brown Library, Brown University). Courtesy of the University of Virginia Library, in online collection The Atlantic Slave Trade and Slave Life in the Americas: A Visual Record, #NW0061.